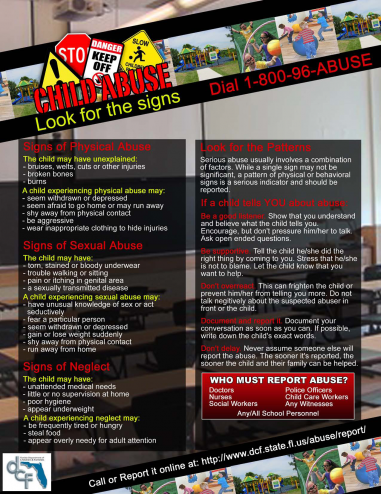 All Somerset Academy Village employees and agents of Academica are required by law to report any suspected case of child abuse, abandonment or neglect, as well as alleged misconduct by instructional personnel or school administrators which affects the health, safety, or welfare of a student. It is the responsibility of every staff member to report all cases of suspected abuse to HRS. Any teacher who must contact HRS must inform the administration for the appropriate follow-up. Any case of abuse involving a member of the staff will be reported to the administration and to HRS. Staff members are to report cases to HRS at 1-800-96-ABUSE, document the report in their Anecdotal records and log the phone call.